We were recently on Old Bethnal Green Road picking up a coffee at The Common coffee shop — one of our regular coffee spots we hit up when in that part of East London. Following our coffee hit we always like stop by and check in on the Vhils wall (Previously on Hookedblog) located just across from the coffee shop, usually taking one of two photos of the piece as it ages with the elements. 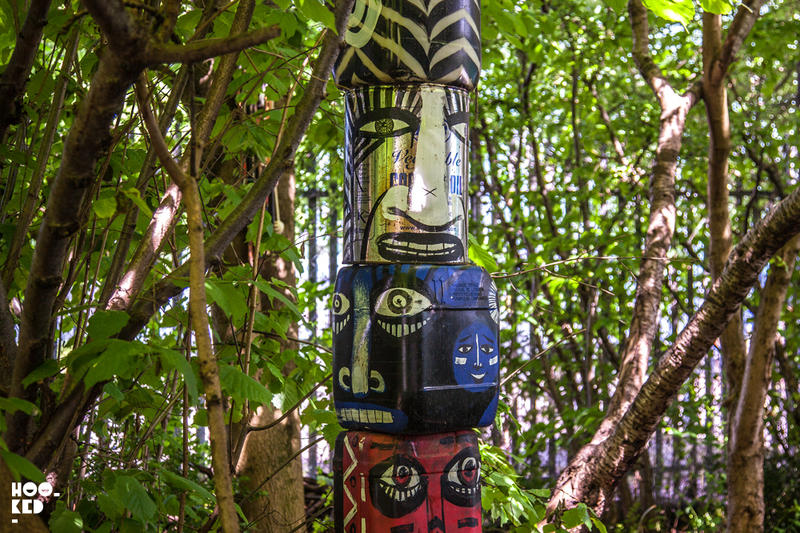 The little know piece is hidden away on a side street not far from Bethnal Green Underground station and has been there since 2014. 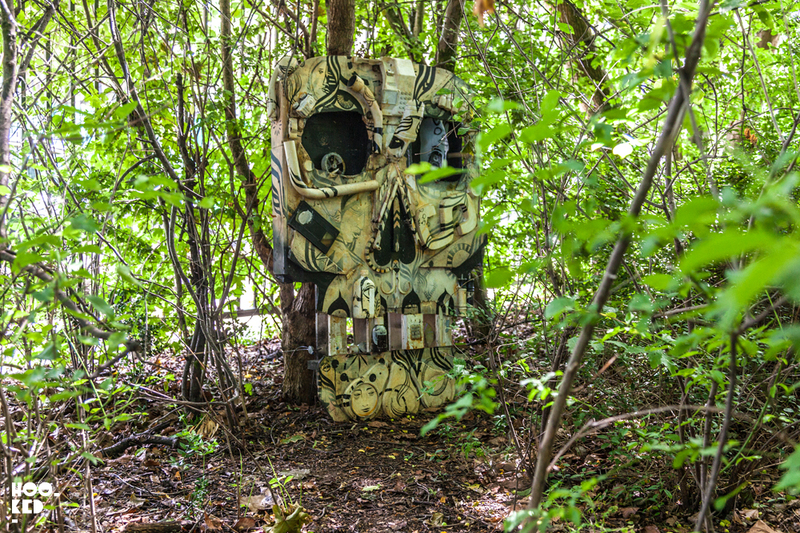 The Portuguese artist was invited to create the work for the Phytology Project based within the grounds of the Bethnal Green Nature Reserve. While checking in on this work we spotted a printedvnotice from the Bethnal Green Nature Reserve pinned next to the wall that caught our eye. 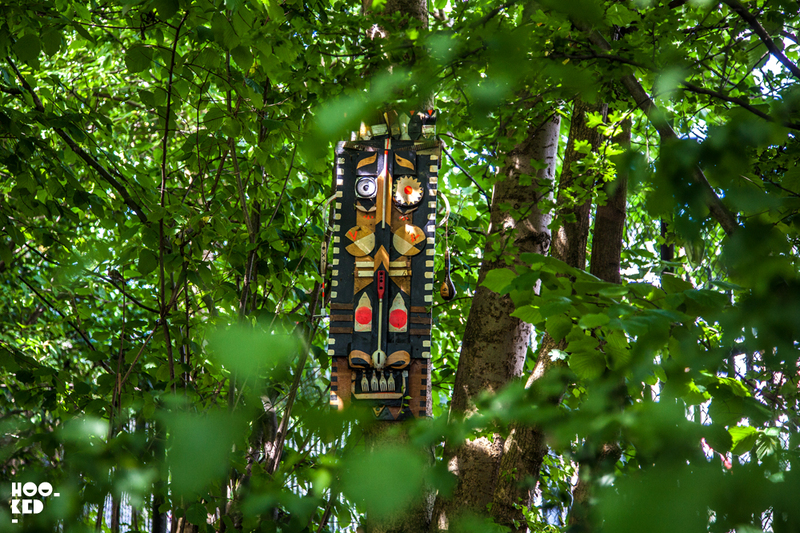 It featured highlights of Phytology's summer projets which included a listing for 'Places to Dwell that May Never Have Been Seen', an outdoor site specific installation in the gardens by Birmingham based installation and street artist Lucy McLauchlan. 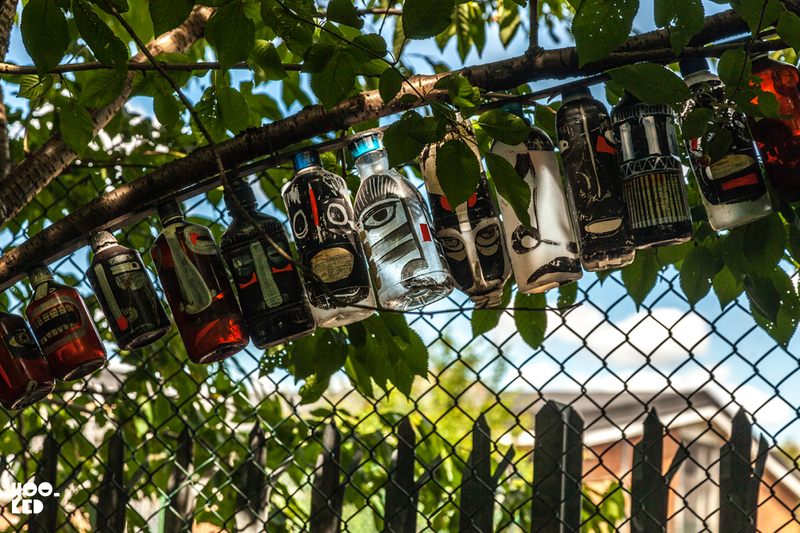 We had not seen this event listed anywhere and as long time fans of Lucy's work it was a nice surprise to discover the location-responsive installations. 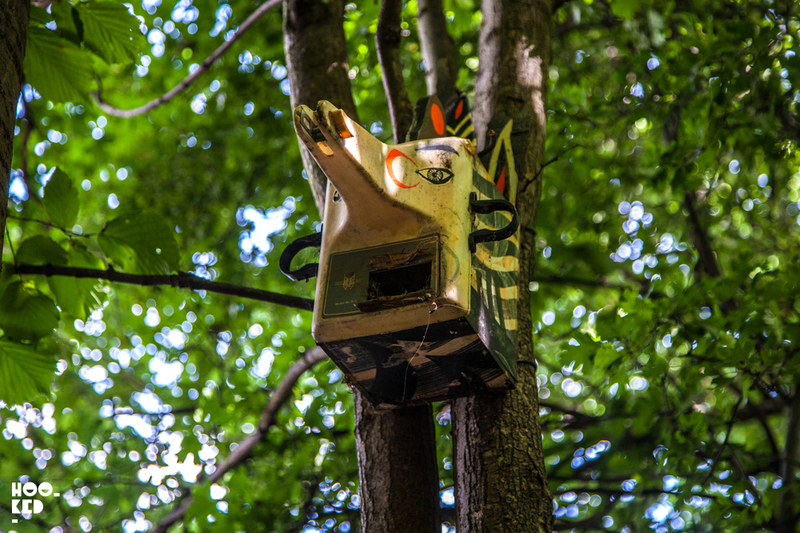 The Bethnal Green Nature Reserve is a little wild in parts and you really need to explore the space as the series of works by Lucy are hidden in amongst the trees and shrubs both on ground level and suspended above head in the trees. 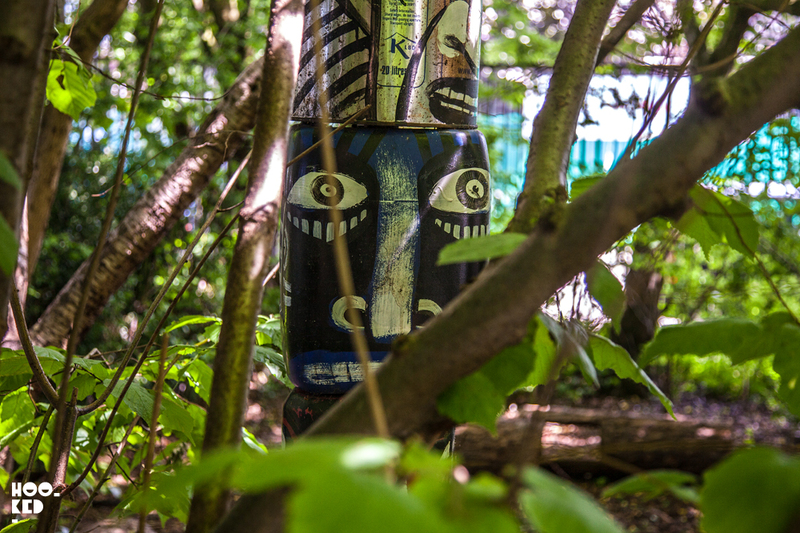 The collection of sculptures and totems have been constructed using found plastics / scrap and other waste ranging in size from the small hand painted bottles hanging from the trees to the larger totem sculptures constructed from large plastic drums stacked on one another, sourced from the Nature Reserve and beyond. Phytology is an artist & community led project exploring the use, value, resilience and function of wildness within an urban ecosystems. 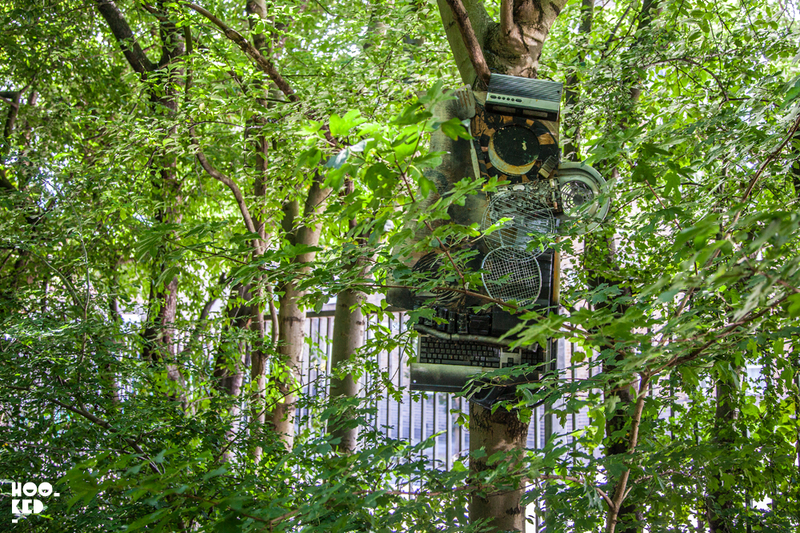 Launched at Bethnal Green Nature Reserve in 2014, Phytology is part physic garden; part cultural institute; part urban wilderness; and a platform for collaboration between artists, musicians, writers and a wide variety of community groups. 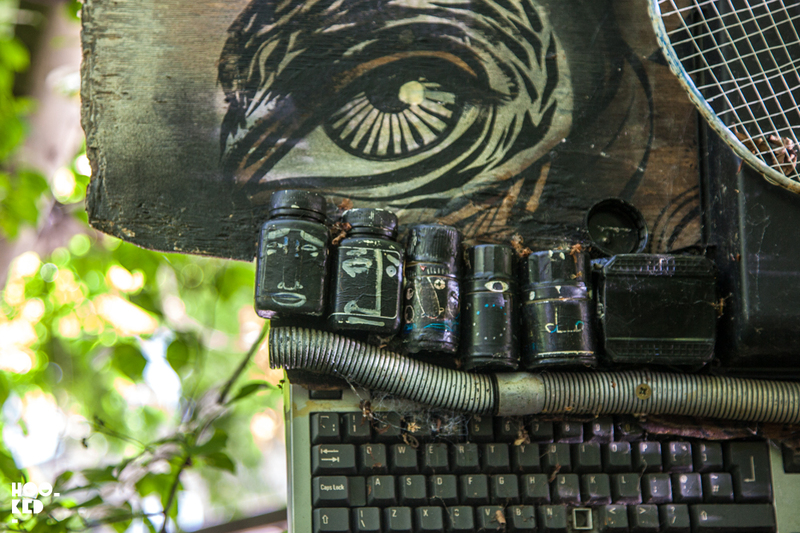 This is a Nomad Projects commission – supported by Arts Council England. Opening time — 11am – 6pm, until the 2nd September 2017. Address — Bethnal Green Nature Reserve, Middleton Street, E2 9RR, London. Overground Train – Bethnal Green (Stop D).